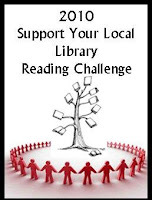 I love this challenge because I love my local library! So. Here's the challenge! There are four levels! And the great thing is you can change levels as you go along! My goal will start at the lowest and I hope to get to the top level, but I am not sure that will happen for me. The Mini – Check out and read 25 library books. Just My Size – Check out and read 50 library books. Stepping It Up – Check out and read 75 library books. Super Size Me – Check out and read 100 library books. I will post my books here!